The director of data science at the Washington institute noted: "But whether we see significant progress or stagnation depends on how well or poorly health systems address key health drivers." The study also highlighted the top 10 causes of death in each country. 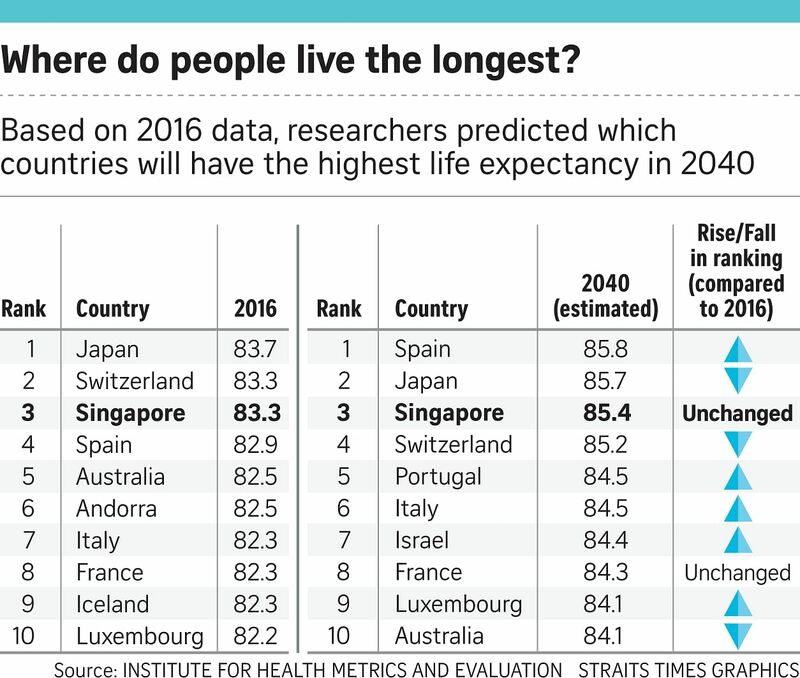 For Singapore, the top three in 2040 are forecast to be lower respiratory infections, such as pneumonia, followed by dementia and ischaemic heart disease. Mr Christopher Gee, a senior research fellow at the Institute of Policy Studies, said Singapore's investment in public health over the past few decades has meant most people have grown up in "an ever-improved environment with high standards of healthcare". He said an area to focus on in the coming years is community care. Associate Professor Angelique Chan, executive director of the Centre for Ageing Research and Education at Duke-NUS Medical School, also noted: "The right mix of planning, policies and programmes can mean the difference between reaping the longevity dividend with healthy, active and socially engaged seniors staying productive longer, or bearing an increasing public health bill due to more sickly, frail and poorly ageing older adults."